Sender-inner Michelle describes this image as "the cutest photo of a lamb in sweater I've ever seen." Um, I'LL SAY! Apparently, this little lambykins lives on her in-law's farm in Australia. Absolutely, fully, and totally redonk. Looks like he's going out to get the newspaper. A sheep in sheep's clothing! With the sun shining through!!! Is it just me or does lambykins look like he's smiling? Is this a wool sweater? Lamb: "Why am I getting this feeling of...deja vu? Yeah, that's what I mint - MEANT, MEANT - to say!" A clean pink fuzzy glowing lambie in a grandpa sweater? *thunk* That's it, folks, I think I've died. Wow, they really are clean. 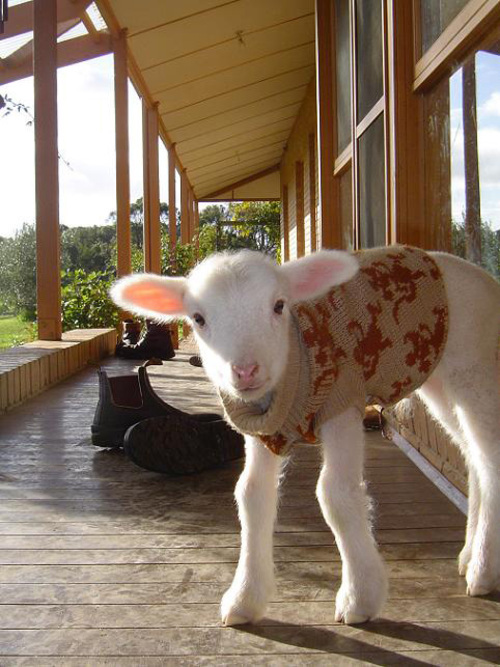 I just got an e-mail from my husband that said, "there's a picture of a lamb in a sweater on Cute Overload." Of course, I had to drop everything and come look. Eeeeee! Not only are those hoovlets clean--they feel like little erasers (it's true.) And note the oh-so-chic Blunstones (or are they RM Williams? )lined up on the porch. The whole thing looks like a fall fashion photo shoot for Australian Vogue. Reeee-donk! And, he does sorta look like Mr. Rogers. Heeeeee. mein gott, it's Sean! From Wallace & Gromit's "A Close Shave". I love the knobbly knees and the fuzzly ears with the light shining through! What *are* those creatures on the sweater? Mice? Wolves? Dancing kangaroos? It's the icing on the cake, really. RidBaxter -- you took the words right out of my fingers. No need to be sheepish. That's ridiculously cute. A SWEATER! And it's a LAMB! Is that lamby wearing a MICKEY MOUSE sweater??? OMG! He needs a snorgle! well... not really demand... just... sort of suggest... please? Awww.. how cute. Think about this lil darling next time you eat a gyro. Seriously, "Awww its so cute I could just DIE but as soon as its dead it'll taste mighty fine!" Calves, pigs, ducks, chickens... they all feature prominently here and you all go to bits over them but YOU KILL THEM AND EAT THEM. Pure hypocrisy. THERE ARE TWO NEW ADDITIONS AND ONE NIFTY UPDATE NOW IN THE GLOSSARY. Otter - a platypus plea be respected! oh goodness! it's shaun the sheep from wallace and gromit's "a close shave!" so cute! I've got a banana here too, if you're still hungry. MAKE THAT *THREE* NEW GLOSSARY ADDITIONS. I thought the sheep in Wallace & Gromit was actually called Shorn? Mmm...can somebody with more internet time than me look that one up? OMG! So cute!! Fuzzy ears and that sweet lil face. G'day mate! Ceebs -- that was a little winking retribution, right there. It's not new, tho. Tink -- it was Shawn (Sean), probably *because* it sounds like "shorn". For the next 30 minutes there will be a blue-light special on all of our lamby-kins sweaters for snorgling. Buy one, get one snorgle for free. Have a cute day and thank you for shopping at Cute-mart. Lambs in sweaters! I haven't seen such a thing since I was young and in 4-H. It helps keep their coats just so after you shear 'em. Brownamazon, I had the same feeling about that "fall catalogue" look a like, it's the sweater and the boots. And the liiight is... woaaaa. Where is this place? A platypus would surely make for original snorgles! yes, I'm happy to find animals adoreable when I'm not eating or wearing them. :) What did those innocent plants ever do to you?! Some day, a device will be made so you can hear flowers scream every time they're plucked. to the "Sound of Music, The" entry in teh COG? Look how small he is against the shoes behind him! Little sheepy sheep!